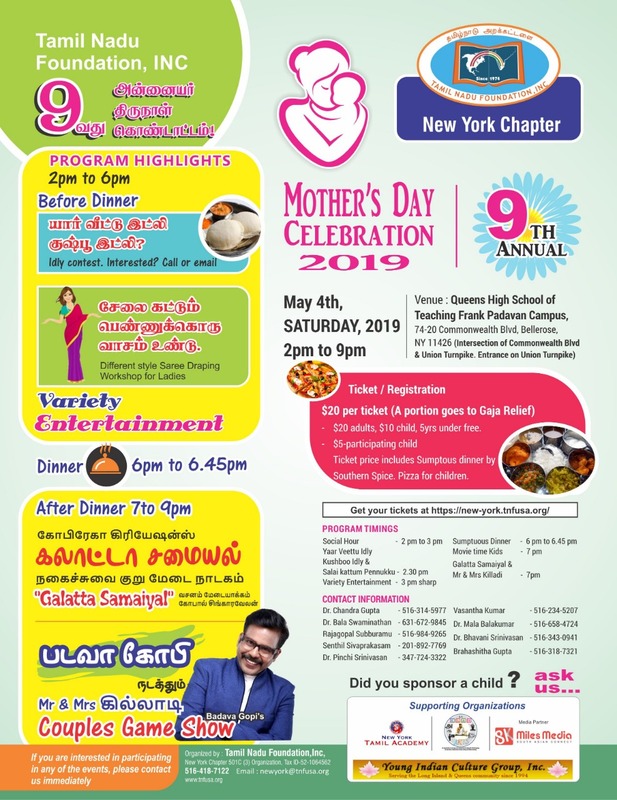 We are celebrating 9 th Annual mother’s day on May 4 th 2019 at 2 PM to 6 PM with our special Guest Badava Gopi. He conducting Mr & Mrs Killadi Couples Game show and lot more Events. If you are interested in participating in any of the events, Please contact us immediately. Register your tickets for Adults $ 20, $ 10 for Child and $ 5 child participating. Ticket price includes Sumptuous dinner by Sothern Spicy. Pizza for children. TNF’s New York chapter was born due to the efforts of Mrs. Brahashitha Gupta and a team of dedicated charity minded individuals in New York city area. The chapter is known for its novel idea of dedicating the Mother’s Day to remember our motherland. Its annual Mother’s Day event continues to grow each year in attendance and funds raised.